Arnold, the oldest, was born in 1919, and Lillian in 1925. Both were educated at Scandinavia School. A daughter, Evelyn, and twin boys, Melvin and Gordon, died in infancy. Lillian remained in the Scandinavia district until 1942, when she went to British Columbia. There she got a job in a rope factory and later worked for the Empress Jam Company, where she is still employed. In 1946, she married Tommy Larson, and they reside at Coquitlam, B.C. They have two daughters; Linda, born in 1946, and Pamela, born in 1956. They both reside at New Westminster, B.C. Arnold remembers his first experience at driving a Model T car when only nine years old, and his first test at carpentering came at the age of ten. He tried to build a dog house and remembers his father giving him heck for wasting lumber. He stayed on the farm until 1948, then went to Minnedosa, Man., where he went into car­ pentering for a living. In 1948, he married Dolly Ken­ nedy, who also came from Scandinavia. They have two daughters; Judy, born in 1950, and Kathy, born in 1954. They reside at Calgary, Alta. 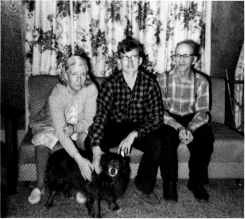 In 1950, Arnold built his own home in Minnedosa and they still live in it. He worked for Sigurdson Construction for 23 1/2 years and is now self-employed. August was born in Jamtland, Sweden, in 1896, and came to Canada in 1913. He arrived in Halifax by boat and came to Minnedosa by train. When he first arrived in Minnedosa he went out to Fred Ostrom's farm, where his brother Charlie was working. From there he worked on various farms, sawmills and threshing outfits, Hem­ mingson's, Olson's, and Ostrom's, to name a few. In later years he was also part of the crew that cut scrub to clear No. 10 Highway through Riding Mountain National Park. He worked for several years and sent money back to Sweden to help pay the way for his parents and brothers and sisters to come to Canada. They arrived on October 25, 1918, and settled in the Scandinavia district on S.E. 33-17-17W on a farm which was later to be known as the Block farm. In 1927, August, his parents, brothers and sisters moved to a farm in the Crocus district, S.W. 2-17-18W, where he and his parents resided until their passing; his mother in 1935 as a result of a car accident and his father in 1946 from a heart attack. In 1946, August married Elsie Mary Smith, daughter of Sidney Smith of the Hilltop District. (refer to Smith, Sidney). They had one son, Peter Donald, born in January of 1947. He attended Lakelet, Clanwilliam and Minnedosa schools, as well as taking a welding course at A.C.C. Don is a welder by trade and has over 15 years' welding experience. In 1976, he married Janice Marlene McClay. In August, 1980, a daughter, Janie Marie Olivia, was born and in December, 1982 a son, James Donald August arrived, making the family complete. Janice has her own C.B. business. The family live in Minnedosa. August passed away at the age of 81 years in June, 1977, and in December, 1977, Elsie passed away at the age of 63. Oregon, USA. They had no children. In 1918, Eskil and August and the remaining family came to Canada. (see Backlund, August) The first place they went to when they landed at Minnedosa was Mrs. Block's boarding house for coffee. Then Fred Ostrom took them up to his dad's old homestead somewhere in the Hilltop area, and later they settled on S.E. 33-17- 17W, which later became the Block farm. Eskil was so homesick for Sweden when he first arrived that he walked up and down the road and would have gone right back if he had had the money for the fare. Edith (1899-1965), the oldest daughter, worked at Minnedosa for a year or so before going to Minneapolis, Minn., where she married Mr. Burgett. They had three children; Margaret at Seattle, Washington, and Clarence and Clifford at Minneapolis. Amy (1903-1979), the second girl, worked in Min­ nedosa for a while. She married Les Armitage and later went to Gary, Indiana, and retired in Bradenton, Florida. They had four children; Margaret and Lillian in Ontario; Elmer at Gary, Indiana, and Marion at Bradenton. Les is also deceased. Eskil (1906-1943), the fourth son, finished his schooling at Scandinavia. He worked around the district for a number of years before going to Minneapolis, where he stayed for a short time, then on to Montana where his two brothers were working. He married Gordie Herris and they had two daughters, Beverly and Sherry, who reside at San Jose, California.